Germany sets an example for the world at large reporting almost 35% of power coming from renewable energy sources in the first six months of 2017. The country generated green energy from solar, wind, hydro and biomass sources. The percentage rose to 35% from 29% in 2016. Renewable energy generation (@~5-6 cents per unit) is much cheaper in Germany compared to thermal/ fossil fuel generation (@~10-14 cents per unit or even higher). Even if we do not consider the green credential of renewable sources, the price dynamics alone makes much sense to go green! Germany sets an example for the world at large because despite not being a very sunny country and other hurdles, it managed to generate a substantial portion of its energy requirement from solar. Germany recorded 1.7 million solar systems owned by its citizens which grant them the relief from paying their electricity bills. Germany recorded getting up to 85% of its electricity from renewable sources on certain sunny, windy days this year. Most of Germany’s coal-fired plants were shut down for the particular day. The country has resolved to completely phase out its nuclear power plants by 2022. GHG emissions are also expected to be reduced by 40% in 2020 from 1990 levels. Renewable energy sources and solar in particular have grown exponentially over the last decade. The amount of solar power added rose by almost 50% worldwide in the last year itself. 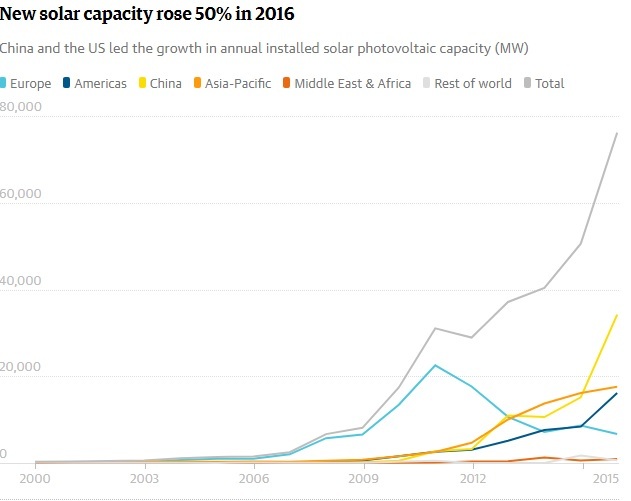 Globally, more than 300 GW of solar power capacity exists today, up from just 50 GW in 2010. It is in dire need for the existence of mankind and life on this earth that countries realize the importance of going green and saving the environment. The main purpose of Paris Climate Change Agreement is to “bring all nations into a common cause to undertake ambitious efforts to combat climate change and adapt to its effects”. As such countries should keep moving the renewable energy way to cut down fossil fuel and in turn GHG emissions.